• Locations to remain secret "for obvious reasons"
WASHINGTON (CNN) -- New York City will be protected by a ring of devices to detect nuclear or dirty bombs before the end of the year, the Department of Homeland Security said Friday. A dirty bomb is one that spreads radiation without employing a nuclear explosion. The Department of Homeland Security hopes the circle of sensors will give warning if a bomb is transported into the city by land. Most previous detection efforts have focused on preventing a bomb from being smuggled into the city by sea. Under the "Securing the Cities" initiative, detectors will be placed along highways, at truck stops, in weigh stations and at other sites on the perimeter of New York, as well as locations closer to the city center, an official said. Locations will not be made public "for obvious reasons," the official said. The department's proposed 2008 budget would provide $30 million for the project, in addition to the roughly $16 million that has already been invested. 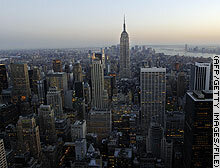 The New York project will serve as a test for other cities, the official said. Homeland Security is building the network in cooperation with the New York Police Department and other state and local governments in New York and New Jersey. Local governments will respond to any alarms. "We expect to have this operational this year," the official said. He said the participants are working to establish protocols on how to operate the system and respond to alerts. Devices to detect nuclear or dirty weapons will surround New York City by the end of 2007, a Homeland Security official says.